How to break free from work overload? One of the pivotal issues in stress management is the management of work overload. 10% of the population in the industrial world suffers from overstress (clinically known as insufficient supply of messengers from the biogenic amine and endorphin system). Overstress basically results from two factors: (1) work overload and (2) change. As for change, even seemingly pleasant change factors add to the stress load: marriage, vacation, fabulous date, new job, etc. Those who are in overstress should look for stability, as opposed to change. One of the best formulas: make your life regular like clockwork! If it becomes boring... well... at least it is not going to be stressful and damaging to your health. There is a simple way of telling if stress and change are welcome in your life: as long as they are detectably pleasurable, they are not likely to be harmful! prioritize your e-mail using the to-do list metaphor, etc. the use of personal information managers (PIMs) is becoming more and more popular. All ideas can be jotted down or scheduled for execution on a given day. However, with passing time, there is an increasing volume of notes, tasks and appointments, and you may waste an increasing proportion of your time on browsing your to-do lists and rescheduling appointments. You do not need to be a procrastinator to find yourself shifting tasks from day to day again and again (dozens and perhaps even hundred times)! Shifting a task may cumulatively take more time than actually executing it in the first place! Tasklists solve the problem of excessive workload! whenever possible avoid tasks that require scheduling or tasks that are limited by deadlines. This is often not possible but it usually makes your life and planning much easier. Avoiding deadlines is often a matter of lifestyle, not necessity. Check if you are not getting overly dependent on or even submissive to others. Learn to say no and avoid promises (except: I will put it on my to-do list and do it when its time comes). Check if (unwanted) promises do not make most of your deadlines! The value/time criterion is universal and should generally be applied to maximizing the efficiency of your actions across the board. After all, whatever your hierarchy of value, you definitely want to generate maximum value per unit time. From an investor's perspective you might ask: Why not use the profit criterion, i.e. Revenue - Cost or equivalent? Imagine then that you have $100 to invest and you got two tasks: one will make you buy a software package at $100 and resell it at $105. Another one will make you buy a battery at $1 and resell it at $2. Using the profit criterion, you would start from buying the software package. After all that gives you $5 as opposed to $1 in case of batteries. However, with your $100 you can buy 100 batteries and end up with $100 profit. In other words, you cannot use profit as the sorting criterion. You would rather use profit/investment criterion which would put batteries (profit/investment=1) well ahead of the software package where: profit/investment = (revenue-cost)/cost = (105-100)/100 = 0.05. Are tasklists a tool of stress-management? If you use tasklists, you do not have to worry about your to-do lists growing beyond a thousand items! Using a rationally prioritized to-do list is another way of admitting: You cannot do everything what others would want you to do! You cannot do everything what you yourself would want to do! Just do your best! end of worry about not doing important things! If they are not done, even if they seem important, they are not done because of a simple impossibility! end of worry about others asking you why you do not do what they asked you do to! Present your tasklist and your valuations. As an act of courtesy, you can even increase the valuation of a task in question. If this won't push the task to the top, you will just no do it! Period! Tasklists are an excellent stress-management tool! If you disagree or simply believe tasklists are a waste of time, drop me a line. I will gladly comment upon your opinion or even add your comments to the bottom of this web page. What tasklist manager can you use? However, the good news is that ... our speed-learning software SuperMemo makes it easy to prioritize tasklists and sort them using the value/time criteria! The reason for which tasklists have crept into SuperMemo is that they are a foundation concept for implementing the so-called reading lists. 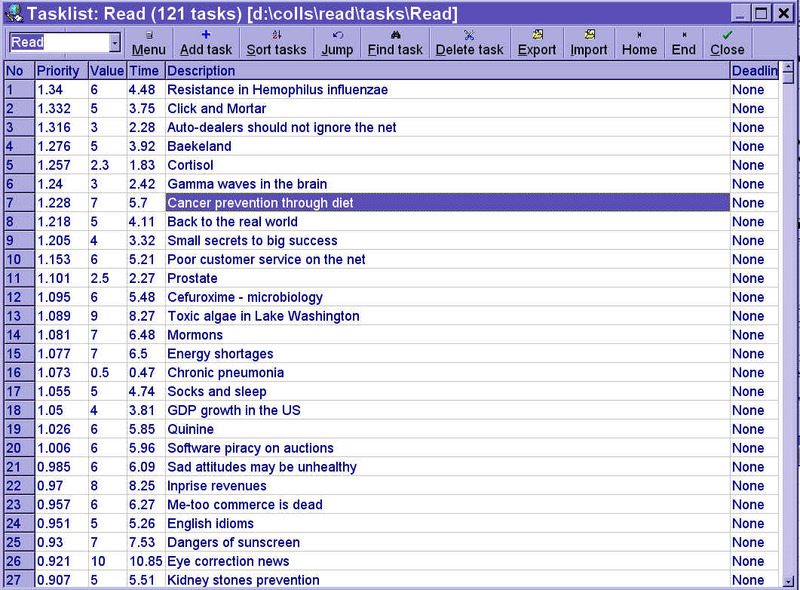 A reading list is a tasklist in which each task is an article to read. SuperMemo 99 for Windows uses reading lists to make it possible for students to easily convert knowledge available in electronic articles into knowledge that can effectively be remembered. Tasklist management is an underlying concept for reading list management, and appears to be a valuable implementation side effect that will help you use SuperMemo for handling your tasklist! In other words, you can now use SuperMemo in time-management and stress-management! I have used tasklists for nearly a decade, and find the implementation introduced to SuperMemo an excellent boost to the program's functionality. I could only wish similar mechanisms were added to Microsoft's Outlook and other applications of this type. Although I consider MS Outlook 2000 a very good application, the availability of three priority levels on the list of tasks renders this option entirely useless from my perspective! With tasklists in SuperMemo, you never have to worry that you will miss an important idea or that storing the idea in your PIM will excessively burden your attention and waste your precious time (browsing, shifting, etc.). Tasklists help you take the only rational and psychologically sound approach to handling to-do lists: Add, forget and execute. Execute: Execute tasks on your tasklist starting with those of the highest priority. You can execute only a single task in a given time slot, keep the remaining thousand tasks untouched on the list, and still be sure that you have done your best! If you would like to rationalize your spending, you might create a shopping list based on the expected daily savings in your time. Item is the item to buy. Savings is your expected daily time you would save as a result of purchasing the item. For example, if you subscribe to Scientific Discoveries channel you might end up spending 20 minutes per day on watching Science News and get back 28 minutes through your enhanced knowledge, which would result in a net gain of 8 minutes (those estimations might be highly subjective but ... they provide a rational underpinnings of your shopping list). Price is the price of a given product. Priority tells you how many minutes per day you would actually save per dollar of your spending. Most of all, you will want to create tasklists for scheduling your daily tasks, tasks for your employees, tasks that make up your projects, etc. For example, the implementation list for SuperMemo is over 2000 tasks long. Most of the ideas come from users of SuperMemo but only a small proportion can actually be put into effect due to the limitations of the implementation cycle in terms of resources, time, deadlines, etc. The implementation cycle begins with selecting key features of the new version (e.g. reading lists in SuperMemo 99). Once these are designed and skeletally implemented, further implementation proceeds strictly along the implementation tasklist. Gradually, the 2000-long list of items is being shortened by adding new features to SuperMemo or by moving tasks to the next release (which is a separate tasklist). Once SuperMemo enters beta-testing, all features that are not labeled as bugs are moved to the next version's tasklist. Finally, once all bugs are processed, the current version's tasklist becomes empty, and a new version of SuperMemo is ready for release. The tasklist for the next version includes all new beta-tester and customer propositions as well as the long list of tasks inherited from and not implemented in the previous version. An important example of a tasklist is a tasklist with tasks for your employee (each employee should have his or her own tasklist in your collection). The value of the task can naturally be measured in dollars (or other currency). Selecting the time field is more tricky though. If you value your time highly, you might tend to record only your own time needed to explain the task and supervise its execution or inspect the results. However, this will give preference to highly valued tasks that need little of your attention but may otherwise be long-drawn and wasteful. This will tend to act as a way of getting rid of an employee by giving him or her arduous jobs that may last for hours or days. It will cost you little except for being wasteful in terms of the employee's time. Naturally, you cannot use the time of your employee as the time attribute of the task because the expenditure of your time is unlikely to be negligible. The only rational solution is to combine the times you and your employee will need to execute the task. Obviously you will want to multiply your time by an appropriate value to express the likely case of your caring more about your own time than about the time of your employee. A 10-fold difference in valuation would not be surprising. It is the privilege of a boss to feel important. A more convenient solution would be to convert your time to dollars and your employee's time to dollars and simply add the two dollar numbers.